Successfully Added Touchscreen Cell Phone - Dual Active SIM + Large Display to your Shopping Cart. Touchscreen cell phone with a large 3.0 LCD screen and two active SIM card slots. This smartly designed mobile phone has a great welcome screen with quick-start touch icons for your favorite functions along with a big time display and listings of new messages, missed calls, and to do tasks. When in the "closed" bar position, the phone is easy to take out of your pocket to quickly answer calls and messages using the dedicated keys and touchscreen. When in the "open" swivel position you now have additional dedicated function and navigation keys along with a widescreen display for viewing media and playing videogames. With native dual band GSM/GPRS and two SIM slots (with dual standby) allowing you to have two active phone numbers in the same phone, its like having two full featured mobilephones packed into one! Did we say full featured? Let us tell you what you get with this mobile phone; TV, FM radio receiver, MP3/MP4 player, two digital cameras, image viewer, Ebook reader, pre-loaded mobile games, and NES game emulator. However, phone functionality and ease of use are where this baby shines. The display on this phone is so sharp, and the navigation menus simple to use via touch or the keypad, that all the other great features are just like an added bonus. Order yours today and get ready to give up the headaches you have been having with your previous phone. 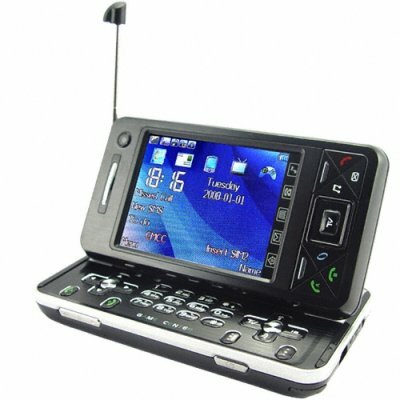 The CVSDW-9800 touchscreen mobile phone is proudly brought to you by Chinavasion Electronics. Order your stock now and don't forget to sell your customers additional add-on accessories like belt clip cases, protective sleeves, and Bluetooth earpieces to maximize your profits. Touchscreen GSM/GPRS cellphone with two SIM slots and clear polarized 3.0 inch LCD display. Large screen mobile phone with easy to use dialing keypad and dedicated function keys. 3.0 inch LCD display with a 240x320/320x240 screen having 16 million colors (display auto changes between portrait and landscape modes).